This entry was posted in Earth Changes, Earth Watch, Earth's core dynamics, Earthquake Omens?, Environmental Threat, High-risk potential hazard zone, Magma Plume activity, Magnetic pole migration, Potential Earthchange hotspot, Seismic tremors, Signs of Magnetic Field weakening, Tectonic plate movement, Time - Event Acceleration, Volcanic Ash, Volcanic Eruption, Volcano unrest, Volcano Watch. Bookmark the permalink. Very true, Wiseguy. We are at a precipitous juncture in human history on planet Earth. There is also a climate link. In the past when the planet warmed up apparently so did volcanic and earthquake activity. Any idea Alvin, if out of the 83 so far, point to any particular region of the globe? Or, is distribution equal across both the Northern hemisphere and Southern? Just curious if this venting begins in one area and gradually spreads. Thanks for all the info you provide. This is pretty uniform across the globe, and I think the planet’s natural means of heat dissipation is failing. 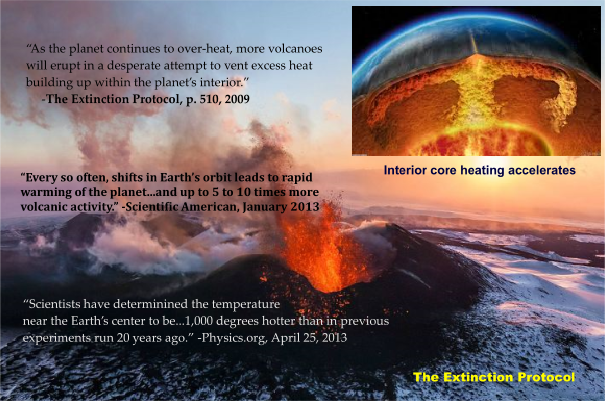 Every time a new thermal threshold is reached with the maximum number of volcanoes erupting, it pushes the planet towards a more chaotic state rather than alleviating its thermodynamic stresses- and thus our Earth slides farther and farther away from any notion of equilibrium. This is happening according the laws of thermodynamics. So the planet will only grow more agitated, chaotic, and unbalanced with time, as it moves towards maximum entropy. The number of volcanic eruptions has been steadily increasing since 1990. This marks every indication of a spectrum shift, from the data. To make matters worst, all the supervolcanoes are all in a phase of simultaneous inflation. This is a very ominous sign that worst things than terrestrial volcanoes going off across the planet are on the horizon. I remember when we were watching the volcanic eruptions back in January of this year. Had a feeling that this would be a record year. Now we wait to see what next year will bring. I just have a feeling that it won’t be good. The annual increase of atmospheric carbon dioxide is about .05 parts per million. Total greenhouse gases in the atmosphere are roughly 26,000 ppm. So any pretension that 1 ppm increase in 26,000 ppm every 20 years or so will drive the earth’s climate is pure fantasy, regurgitated by people who want to control your lives, while they go wherever and do whatever they want. Take Al Gore, please. Al is now being sued. Alvin, thank you again for the great postings. What does all this mean? With all the volcanic activity rising, what do you predict for mankind’s survival? What is the best and worse case scenario? Is Methane the real danger here or perhaps something else? One by one, the planetary systems will begin to falter and will be thrown into greater chaos: climate, volcanoes, seismic tension points, the oceans. It’s pretty bad to worst, from here…with the worst case involving Earth descending into something ‘unthinkable’ and becoming a hellish planet, as was the case with volcanic eruptions in its geological past. If this is the beginning of another planetary upheaval, characteristic of what the ancients warned us about…the only optimism you can dress this in is on how long it takes to unfold. If it’s spread out of a fairly long period of time, the degree of change will be more easier to adjust to, and thus survive. However; given the current parameters, this could happen in very fast fashion. We can’t see the change going on within the interior of the planet or what’s happening in the deep oceans, and that’s to our detriment of trying to forecast a timescale. You’re welcome, friend. It should run several times that day. I’ll keep you posted on other days. Even the hot air from “global warming” enthusiasts is not enough to endanger this planet. Mother Nature is ultimately in control; not man! I have seen a report that the YELLOWSTONE NATIONAL PARK is about to blow in the next 6 months and the ANDREAS FAULT will cause massive earthquakes on the West coast. Not the East coast like some reports have been saying. That’s just a distraction. That’s why all the hype about FEMA. the end of 6000 years from when? Great article! Do you know what the total was for 2013? (I heard about a few eruptions after you published this, but I’m not sure how to interpret that website’s data to tally the total. Thanks! Climate change was explained long ago. We have numbers of comets,astroid explosions,quakes,eruptions,Tsynomi,Draught,Floods,Forest fires,solar flairs,Wind storms. It was predicted to last 15 years by a group which religious followers have labled as”Angels cast out of heaven. Mainstream media has lied in religious denial the entire time. What was documented as seasonal changes was later used to gain religious followers fear being exposed as false prophets and could be more danger to mankind than the hundreds of so-called 100 year desasters. AS long as you don’t try to tell me it’s man made global warming. God made this planet to last 7000 years at least. He will create a new heaven and new earth after that. He Always AVOIDS Reality, Period. If anyone thinks that climate change is made up as a fear mongering strategy or money making scheme – hit yourself in the head with a tack hammer because you are a retard. Anyone with even a remote sense of understanding can see that climate change is real. I live on the North Carolina outer banks and the sea level has risen and continues to. If my comment is not posted then the moderator here is supporting an idea that they feel is perpetuated against them – therefore making you a hypocrite. I bet this lady who thinks climate change is BS also believes that terrorists will come and attack her if the US doesn’t continue its “war on terror”. Speaking of that title – its almost correct – should be “Terror War” as the US is the largest terror organization by far. Thank you. I was searching for the average number of volcano eruptions annually an a first got some real interesting info. Then I started reading the post which started out scientifically interesting. The post drifted to Al Gore and his Global Warming scam and them we got a post from Matt Davis who certain all of us non believers of Good old Al are morons. I have been to the Outer Banks several time by boat over the last 25 years and only hurricanes have changed them. When did Al say the Polar Bears would be extinct again please.